Please post here if you have questions about Sprytile. Also feel free to contact me on Twitter. Hey! I love the tool so far! Thanks! I did experience the bleeding issue when exporting to Unity (following the guide and using the guide tileset), but I'm going to try following the advice in the other thread for that. In the meantime, there was another issue I haven't read about. 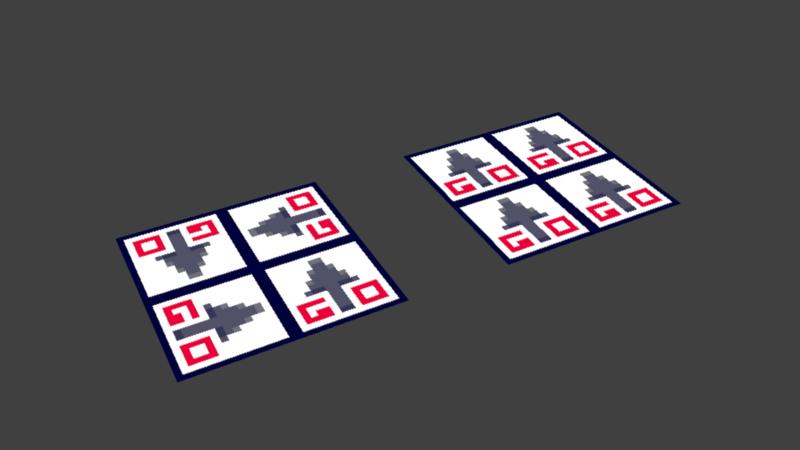 Within Blender, each tile/plane renders on both sides, however, when I export the object to Unity, each plane only renders on one side and the other side is invisible (as expected for a plane). Do you know how I can view this true render state in Blender? And is there any way to automatically place two opposing planes so that it renders on both sides? I have a feeling if I just try creating two tiles on the same vertex but on each side, it'll just replace the first one I place with the second one. Does that make sense? 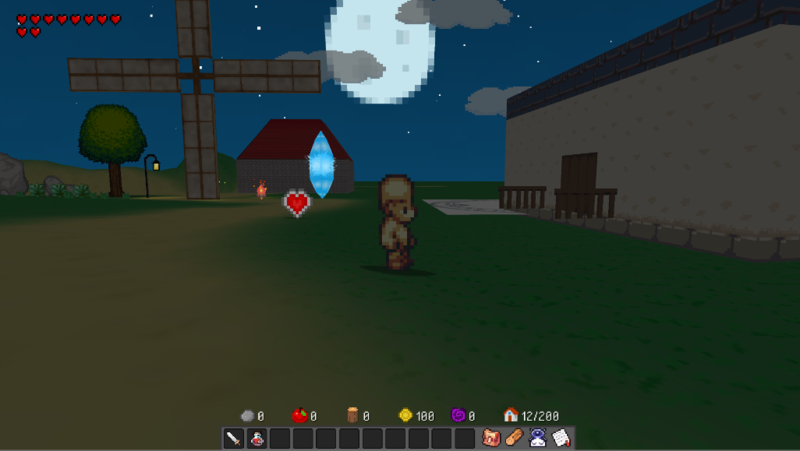 Thanks for trying out Sprytile! You can see how Unity will render your mesh my turning on Backface Culling. In the right hand side panel of the viewport (press `n` if it isn't visible) expand 'Shading' and toggle Backface Culling on. There's a way to make faces double sided using a utility that comes with Sprytile, covered in the advanced documentation. Hope to see the cool stuff you make with Sprytile! Fantastic! I think this is how I'll spend my weekend, can't wait to get home. Thanks so much! I feel like I'm so close to getting this working! I finally got bleeding turned off, finally got the textures to stop being blurry, and double sided planes all work... but now when I actually import the .obj into Unity, I get the weirdest layering issues! That's a pretty neat thing you're doing. This issue should be fixable on Unity's side. What is the material you're using? For reference, I'm testing on Unity with an "Unlit/Transparent Cutout" material and the sorting on the guardrails work correctly. You're right, I feel like an idiot. I stayed up all night playing with Sprytile so my brain must be fried, sorry! I had it set on the Standard shader with the UV map set for albedo but the rendering mode was set to fade. I've set it to opaque and it works mostly great, with the exception that it did something weird to the transparent tiles (the image on the left is before, on the right is after). I'll keep playing around with it within Unity and figure it out, thanks so much! Cool! 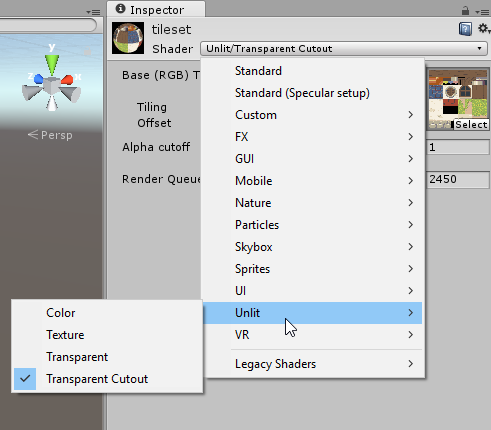 If you come up with good settings for the standard shader, could you please share it in the Unity Import Settings thread? Would be nice to have alternatives to unlit materials in that thread. Thanks! Sure! OK, so I finally got a perfect result I'm happy with, but I'm going to play with it more before I post to that thread. I think it was just another case of me being dumb. I'm using the "Standard" shader with the "Cutout" Rendering Mode--the fatness/weirdness of the wooden bars were due to Alpha Cutoff being set to 0 (I progressively feel more like an idiot the longer this thread lasts, haha, the DEFAULT is .5, not sure how it got set to 0). I set the Alpha Cutoff to x >= .5 and it renders perfectly. I can't use unlit since I have a day/night cycle in the game, and the light adjusts accordingly. I combined this with the technique posted about in the other thread describing the GIMP script that automatically spaces and margins the tileset and I get zero bleeding / perfect rendering. I'll post all the stuff I learn about the Unity workflow after I finish one full asset and I have a bit more experience in this--I don't want to post something incorrect. Thanks again for all your help and for making this and sorry for all my stupid questions! Hi. There isn't a way to repeat the same tile on a single face because it wouldn't be technically possible without a specific shader. What you could do is use the set normal mode on the face and use the build tool to create to roof tiles along that normal. There's a written explanation of set normal mode in the advanced documentation. I saw your Twitter post so this might have been sorted out already, but replying in case it helps other people as well. Which renderer are you using? I've only really tested with Blender's internal renderer and the quick material setup is really designed for an unlit look. The material settings may have to be changed to use the Cycles renderer or for a differently lit scene. The work plane being stuck on a single axis sounds like Axis Lock might be on. It's not covered in the basic tutorial but the written advanced tutorial does. Basically the toggle on the left of the axis indicators in the Sprytile panel. Sprytile's tools are untested with subdivided meshes and is not really designed for that use case. This style of rendering is really neat and an unexpected use of Sprytile for me! Would love to be updated with how you push these renders. Whenever I try to create something using Sprytile, it displays an orange color instead of the tileset I'm using. However, if I render it, the tileset shows up like normal. I'm still learning the ins and outs of Blender, so it may just be a problem on how I set it up. Any help would be greatly appreciated! Thanks for taking the time to check out Sprytile! Can you please try going back to object mode and pressing the "Set Material to Shadeless" button in the Sprytile panel? This might be something to do with your Blender system settings. Can you open your user preferences window and switch to the system tab? For reference, this is what mine looks like. You can also try deleting the lights in your scene. I switched over to cycles and added an image texture and then this worked in cycles but upon returning from this back to blender render. I found that this made my screen do this whole orange thing too. It may be related to this that caused you this issue especially if you tried experimenting around in cycles and then switched back and so on. I tried everything you said above, but the tileset still doesn't display right. My settings seem to be the same as yours. 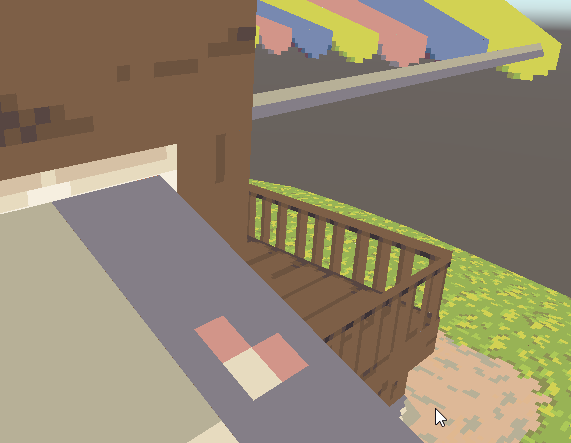 I found a temporary fix where you set the objects viewport shading to rendered. It displays correctly, but the grid is disabled and editing is a bit slow. I'm not really sure what the problem is. This might be a more general Blender issue, but to be sure I'd like to take a look at the .blend file. There might be a material setting the setup function isn't taking into consideration. Would it be possible to upload your file somewhere? Or if not, it could be sent through email. I installed Sprytile on a different computer running the same version of Blender on this computer, and it works just fine. Maybe Blender didn't install correctly? 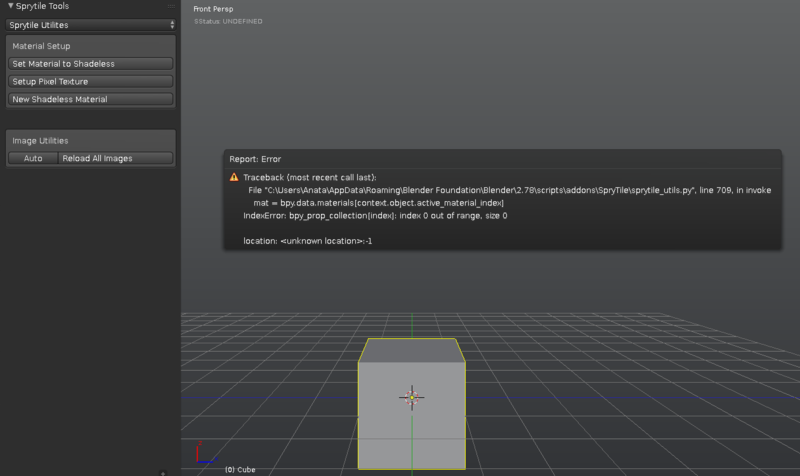 What a strange error, glad you have a usable copy of Blender to use at least. 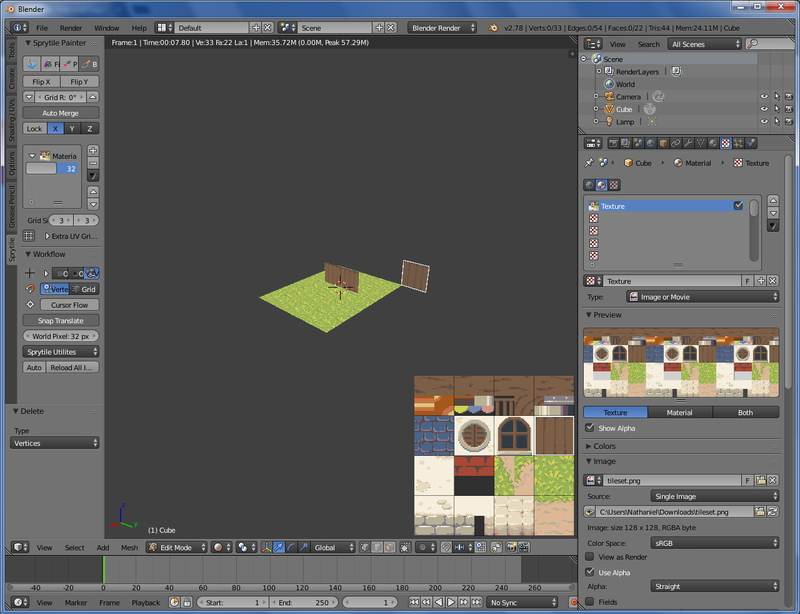 You could also try downloading the portable builds of Blender to see if it helps. Have fun with Sprytile! Hello, i use Blender 2.78 , and look at the beginer video for your addon. I used also Sensei Format addon, dont know if it's the problem. Thanks for reporting this error, I'll add this to the bug list and look into it. I just discovered that, if you select Cycles Render, the tiles won't appear. It`s important to note because some people might run into trouble because of this. Thanks for letting me know, I don't really use the Cycles renderer myself. It's probably something to do with OpenGL access being different when Cycles is active. No, you can just add as an image texture and it seems to work. Hello! I keep getting PayPal's vague error when trying to buy this. I'll try again but have you had any problems from anyone else? "We can't process your payment right now, so please try again later. We're sorry for the inconvenience." I haven't had PayPal errors reported to me yet, but this sounds like it would be better reported to itch. Thanks for your interest in supporting Sprytile! 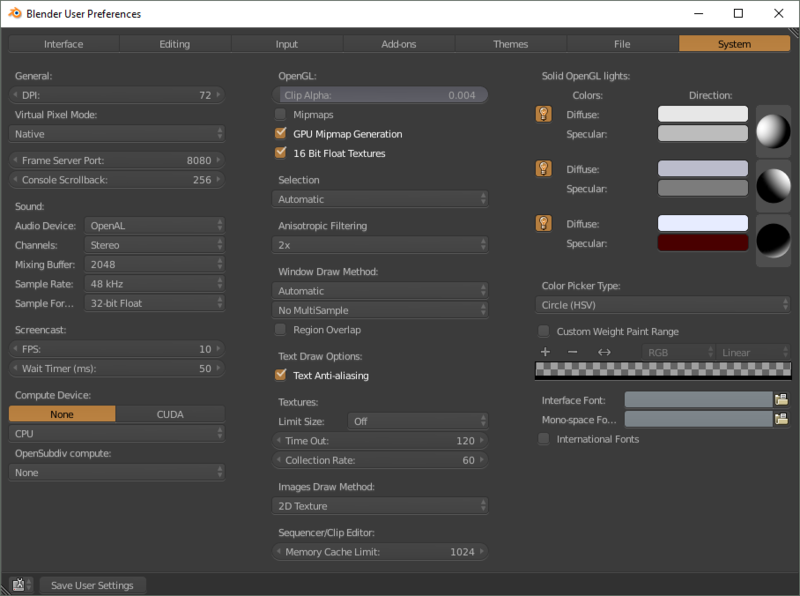 It sounds like the mipmap settings weren't saved in the blender preferences. Go back to the user preferences step in the tutorial about the mipmap settings and make sure to press save preferences on the bottom corner of the window before closing the preferences. I get seams when using this and rendering in blender. Is this to be expected and how do I render without showing the seams? This is using Blenders internal renderer? I've been rendering using that and don't remember having to take any extra steps, the material and texture setup should theoretically take care of it. I'm afraid I'll only be able to help with this tomorrow since I'll be AFK, but try searching for mipmap settings, either in the system settings or the material. The same method that fixes this issue on other engines fixes it for me so I'm currently using a script to convert the tilesets and it's probably for the better anyways since it seems to be an issue outside of blender even if it isn't an issue internally for everyone. I've also had to start unchecking transparent after setting the material to shadeless which I do not recall having to do before (I also recall the first time [before this shadeless issue], I tested this that it just worked without seams as well not sure if the two issues are related or if im just having a false memory though. Hmm, a bit difficult to diagnose this without more to go on. It's possible the problem is the viewport shading mode, which I do need to highlight in the next documentation pass. Make sure the viewport shading is set to material when this happens next. The axis lock button is pressed. Turn off the button under “auto merge” and you should be able to paint on the camera view axis again. Thanks for trying out Sprytile! I've been trying Sprytile and so far I love it! However I have been wondering about the workflow tab, mine is empty. Maybe its a setting I can't find? I have blender 2.79. Well, now I feel silly. I updated sprytile and there it is. Hi there, is there a key to delete tiles? 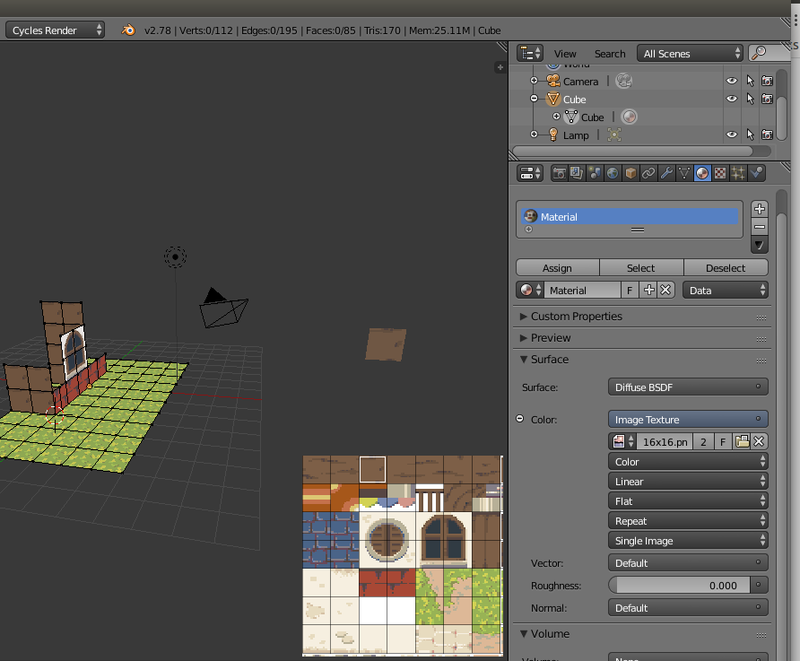 Deleting tiles is done using Blender's workflow for deleting faces. The documentation has moved to a different URL. If links to documentation are broken, you can probably find it in the new URL. Very interesting and well thought out addon you made! However I am having a slight problem, don't know if I'm doing something wrong. When in build mode tilesheet preview/palette does not appear in the lower right corner. Do I have to enable it somewhere, or could have I maybe closed it by mistake? 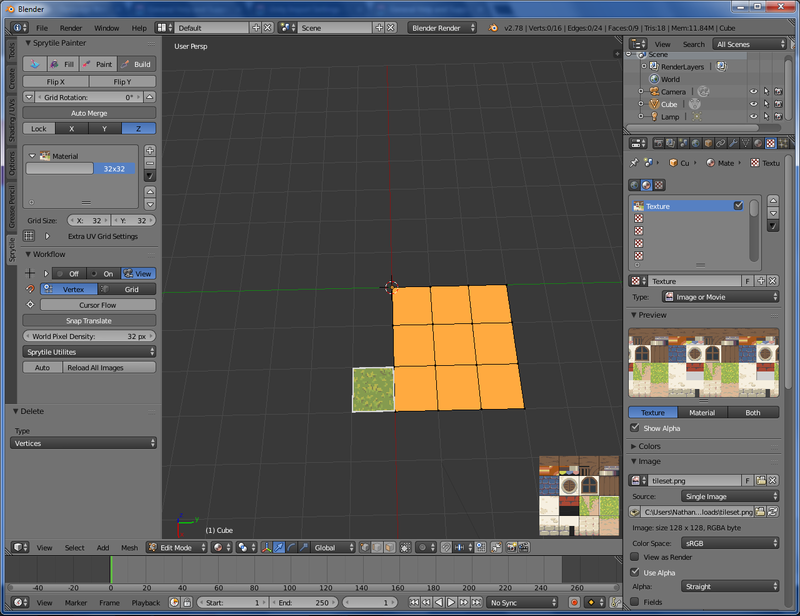 I am using blender 2.79, blender internal render and am in material display mode. Thank you for the great addon and help. Hmm, you shouldn't need to be doing anything else. I can't think of any settings that would do this. When you enter build mode, do you see the tile preview in the viewport? Are you still able to create faces with the build tool? Hi, here is a screenshot. I'm in the build mode, there is no preview in the lower right corner. I thought that maybe some other addon is in some sort of conflict with sprytile, so i turned of bPainter and HardOps addonsm after i took thes screenshot but it did not help. Not visible on this picture is the fact that i can build as intended, i even get semi-transparent preview of the tile, offset works so I can pick the part of my tile set manually via offset but is not the most comfortable workaround. As far as I could see other features of the addon work as intended. edit: just to add.. I am using a 2k tileset that I made, for testing, as I do not intend to use Sprytile for pixel art style. Hmm. I've not tested the UI with a texture that large, I can imagine it bugging out when handling textures at that size. Can you open the system console to check for error messages? 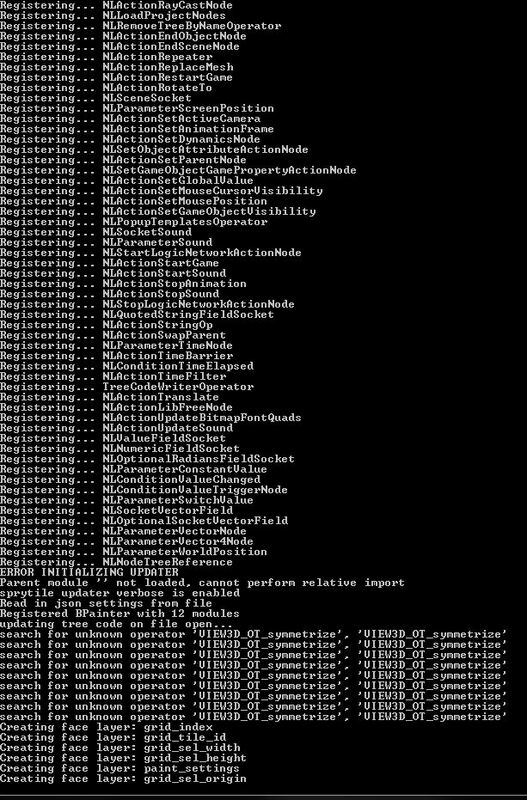 Here is console readout, after starting on a new file, loading tileset, and pressing "build"
Thanks for the console dump. 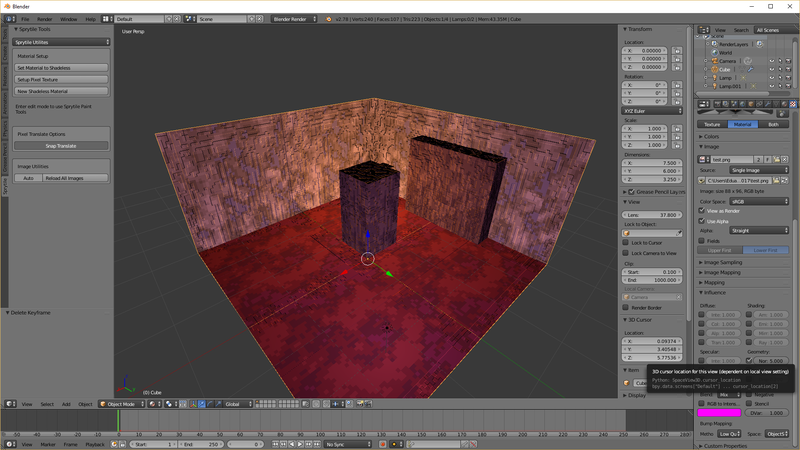 It looks like there are no overt errors, I just never considered the use case of very large textures. cool, are you planing to make loading 2k+ maps available? Great! good luck with your future work! Hi Nikola, the latest version of Sprytile supports 2k+ tilesets. I'd like to get feedback if possible, I don't really have high res tilesets on hand to test it out myself. Thanks! Hi, apologies for this but as a *complete* beginner to Blender I've been unable to follow some parts of the quick start - how exactly do I extrude edges the way shown? I've looked at other tutorials but I can't seem to get the edges to stop snapping to different angles, how can I freely move edges as shown in the quick start tutorial video? No need to apologize, the tutorials really didn't consider people completely new to Blender which I hope to address in the next documentation pass. 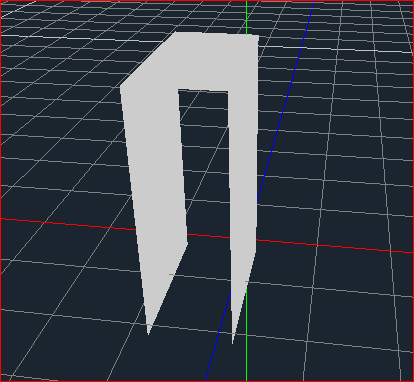 I'm probably not moving edges when tiles are moved at angles, it's more likely that they've been rotated. There's a section of the text advanced documents that shows how to do this. Hope this answers your question, have fun with using Sprytile! The file that you downloaded is the zip file, you're looking at the contents of the file because Windows has a built in zip file viewer. 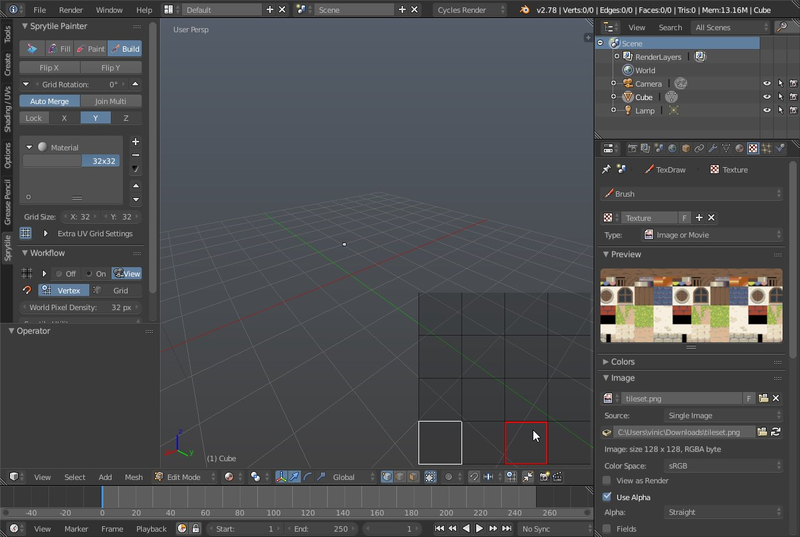 Just use Blender's addon installation as shown in the tutorial/manual. 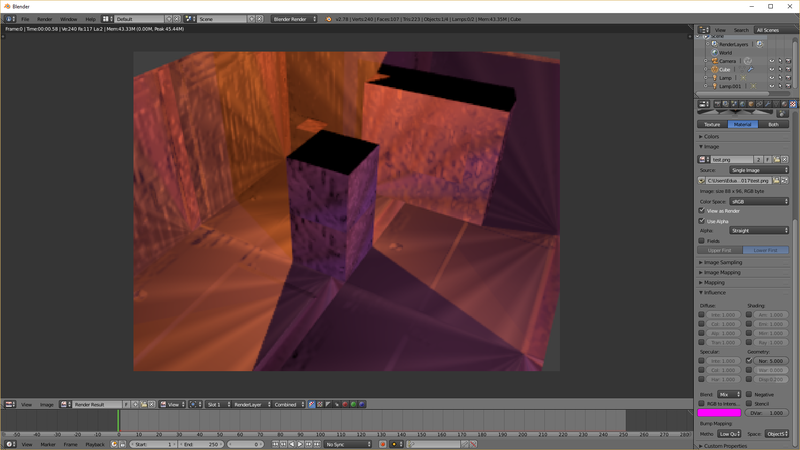 Unreal Engine wants a lightmap for the exported mesh, but unwrapping messes it all up. You guys have any tips for dealing with that? You'll probably want to play around with the smart project settings to add more padding between UV islands or even manually unwrap the lightmap, but this is the basic idea. I had this error too. Just create a material first, and it's works ! Hi, first of all, thanks for the tool, I have been using it extensively. I have one issue, when using the paint mode, often times I am unable to paint certain faces unless I flip the normals. Is there any easy fix to this? To be clear, the normals are all "outside" normals, however for some reason it just doesnt want to accept the face. I had the same problem. I tried exporting the mesh as an .OBJ and reimporting it and then recalculating normals which seemed to fix the issue. Hope this helps. Is it possible to export a texture file from the mesh i have created with sprytile? 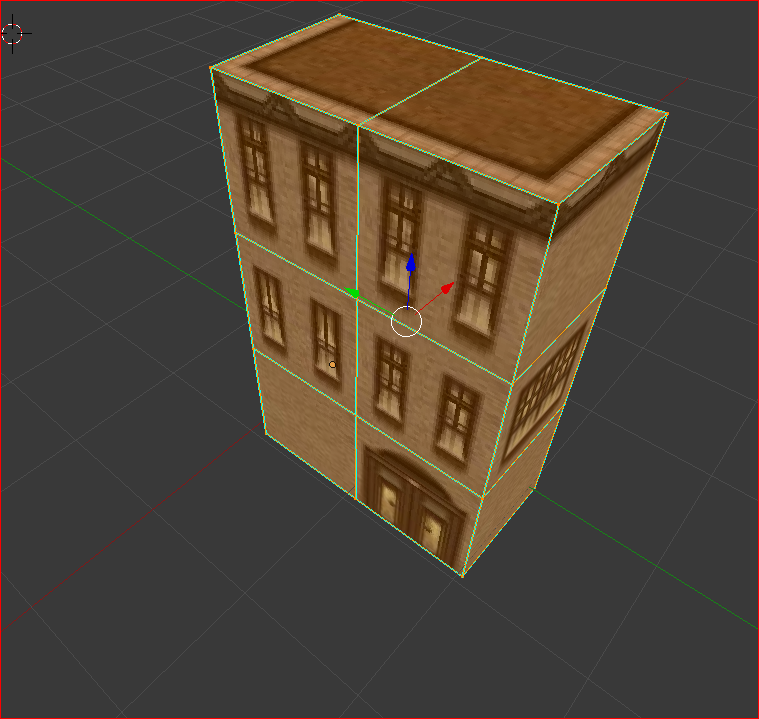 Because every time i save it as OBJ in blender, when I open the file in any other program it never has a texture. Just a shape. I'm not sure how Godot sets up materials, but you probably need to import the tileset into Godot and assign it to the material. For the sides, it might be that the normals of the faces need to be flipped. Is there any way to export the texture as a image file? How would i go about flipping the normals? Rotate the camera and work plane to your desired position and then press the axis lock button. Hi, I seem to be having some trouble getting this to work. 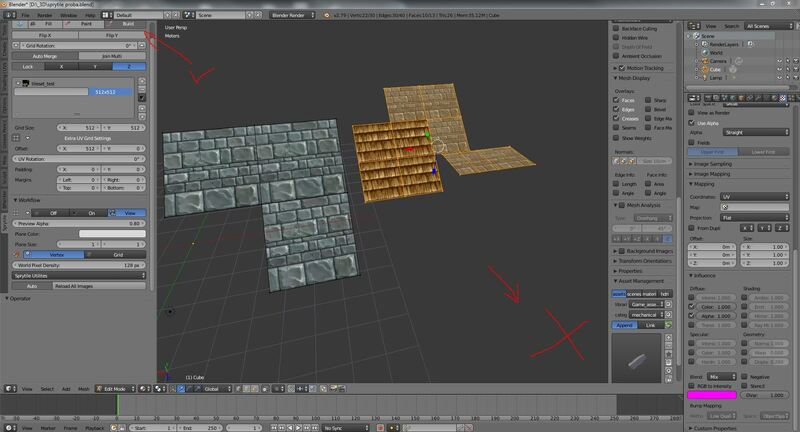 I import my tilesheet (six 64x64 tiles), create a plane, go to edit mode, click paint, and then Blender crashes. I'm using Blender 2.76a on Windows 10. Is there a recommended version of Blender I should be using? 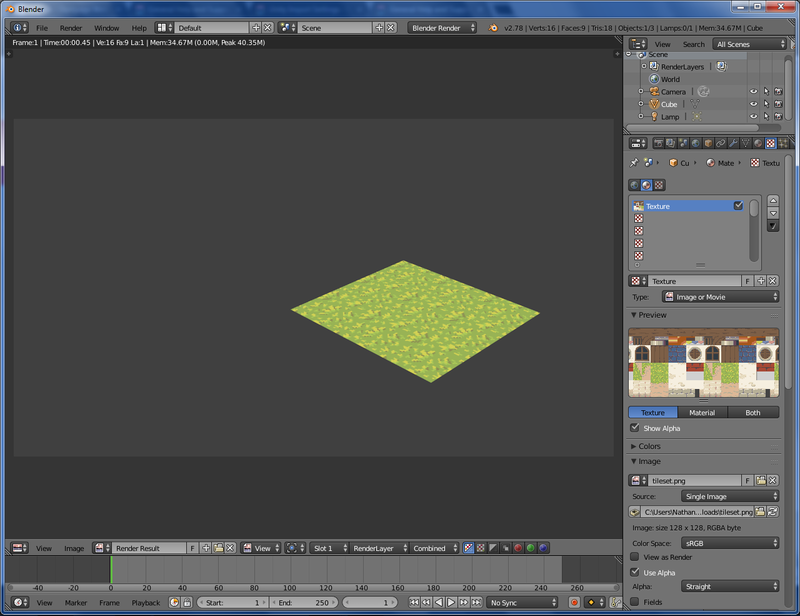 EDIT: So I tried updating to the latest version of Blender, and it works now. Fantastic tool btw! It's perfect for my PS1 style game. Hi, whenever I try to create a project I can't scroll on the tileset UI in the bottom right corner to make it bigger. Any help is appreciated, thanks! Hello! Will you be updating this lovely addon for use in 2.8? Thanks! Yes, I plan to update it for Blender 2.8, I'm starting to look into it now that the beta is out. In build mode, sometimes, faces disappear when I create new ones. Entire faces being deleted sounds like a bug, although I'm not sure how that would happen. If possible a video of the bug might be helpful. In Blender Render I had some lamps set up, but the sprites don’t want to be lit up. I’ve tried all the different lamps already, but the lamps just won’t lightup the scene. Do you have some ETA on the update for 2.8 ? Unfortunately not, there are some APIs that I've not figured out yet and might take some time to work it out. I've also been unable to find the time to work on Sprytile recently, which sets back the update further.